HelloGrads » News & Views » Flavour of the Month: No Tricks, Just Treats! 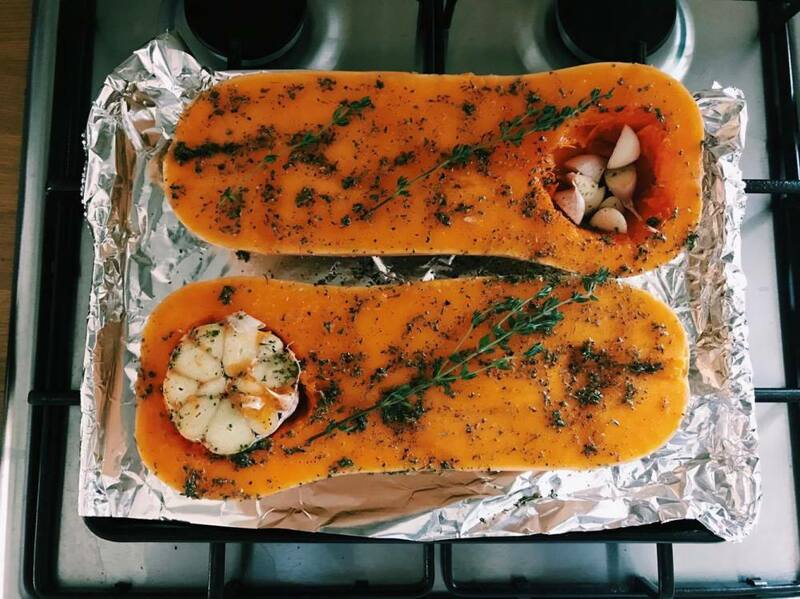 Our first Halloween treat, using seasonal butternut squash, will keep you warm this Autumn 🍂🍁 and is perfect to make in big batches and freeze. Our second sweet recipe is great fun to make with young kids, or for sharing with friends at a party. Enjoy! This soup is a great staple to make as we head into the cold winter months, as it’s really comforting and packed full of nutrients. 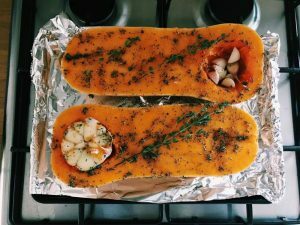 Butternut squash is a great source of beta-carotene and prevents high blood pressure, due to high amounts of potassium. It can also contribute to stronger bones and reduce inflammation, due to its high antioxidant content. Cooking time: 1.5hrs to 2hrs. Pour in the vegetable stock, give it a good mix, and simmer for 15 minutes on a low heat. Add the coconut milk and simmer for another 5 minutes (it will go significantly lighter in colour – don’t panic). Serve hot or keep in thefridge ready for meals throughout the week. In a large bowl mix together the flour, baking powder and bicarb of soda. Sift in the chocolate chips and set aside. In a separate bowl mix the margarine, vegetable fat, caster sugar, brown sugar and vanilla. Set aside. In a third bowl whisk the egg and pour into the flour mixture. Then add the margarine mixture and combine with a spoon, or your hands. Bake between 8-10 minutes, in which the cookies should have gone golden in colour and be soft to touch. The darker they go, the crunchier they will be once cooled. Remove from the tray and leave to cool down on a wire rack. 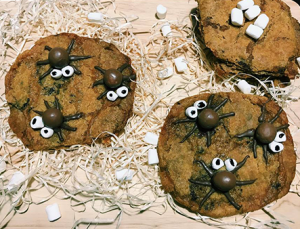 To decorate, glue the Malteasers on top of the cookie with the chocolate writing pen. Use the pen to create legs for the spider. This doesn’t have to be perfect, in fact, the messier the better! 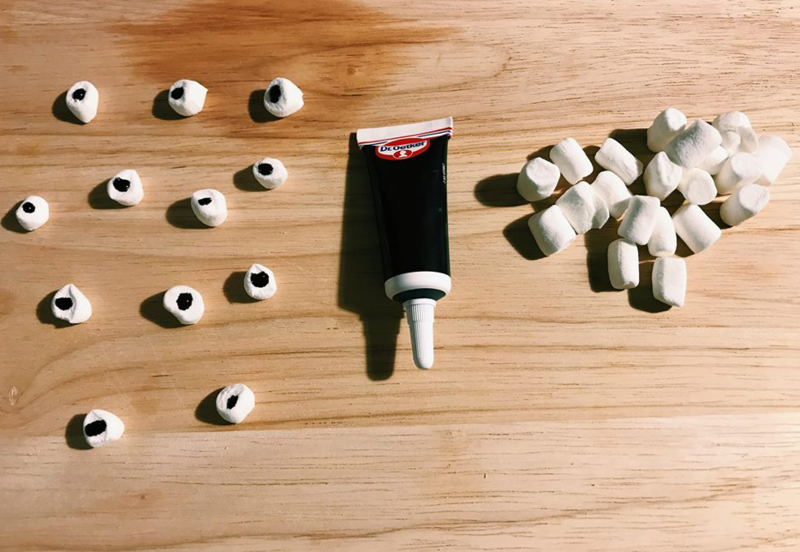 To create the googly eyes, cut a mini marshmallow in half and then dot each half with black food dye.